IndieGoGo Perk: Send Me Something! Our IndieGoGo campaign is in full swing! We’ve got our video up and we’ve been trying to get the word out any way we can. We’re lucky to have quite a few non-local fans and we’re hoping that we reach several more through this project. So what can you get if you live outside of AZ? Well, first off, you get my envy. I wish I was anywhere BUT in Arizona during July and August. Our business drops off – no one gets married when it’s 115 degress outside – but that’s almost okay because it’s too dang hot to stay in the kitchen. UGH! So if you’re sad you can’t get our cupcakes every day, just focus on the fact that you don’t have to deal with what I call ‘the Never Ending Sweats’. Ooops, got a little ranty there. Back to the topic at hand. You live in some other state and you want some delicious, amazing, Our Lady cupcakes? YOU GOT IT! A $50 donation gets you 4 cupcake jars, $150 gets you a full dozen. 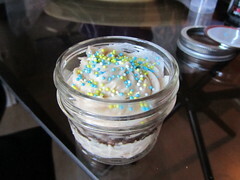 This is an already-baked cupcake with frosting and sprinkles, sealed up in a mason jar. It’s about the size of a normal cupcake but there’s a bit more frosting (so that it stays sealed). 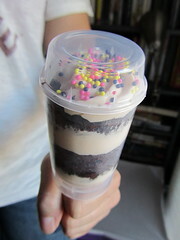 Cupcake jars are good for shipping because they won’t get squished and they don’t get all dried out. These also make a great gift – slap a bow on there, how cute is that? Plus, you get a high-quality reusable jar, for which there are LITERALLY UNLIMITED USES. Seriously, find something you CAN’T use a glass jar for, I dare you. A $75 dollar donation gets you 6 push-pops. Remember Flintstone’s push pop from when you were a kid? This is pretty much the same thing, but with cake and icing. Size-wise, it holds just a smidge less than two full cupcakes – you get about twice as much cupcake goodness than you do in the jars. There are two extra cool things about the pops: They’re pretty much mess free -and- we can put more than one flavor in there. Just like getting a double scoop of ice cream! There’s only one limitation to our cupcake shippables: They *must* have a buttercream frosting. This is to prevent super-meltage and, well, poisoning you. We don’t want to make you sick. So stick with buttercream! That being said, if you want a flavor with a non-buttercream frosting, we can probably come up with a reasonable substitution for you. Options = almost endless! After you donate, you’ll get an email from us thanking you for your order and we’ll ask you to pick what flavor you’d like. The actual product may not be sent out until after the project is done on August 17th, but we’ll keep you updated on when you can expect to find a package full of delicious in your mail box. You’ll also get a nice handwritten card – and the self esteem-boosting knowledge that you really helped out a small business in need. Aren’t you awesome? !